Were you looking for the campaign level or the multiplayer level? SWORD Base, sometimes parsed as Sword Base, was an Office of Naval Intelligence facility located near the Babd Catha Ice Shelf, Eposz on the colony of Reach. The base's interior consisted of a long and tall main atrium, with smaller rooms, walkways and staircases on both of its sides. The atrium had a ceiling of glass running along its length, which also extended down the wall on the other end of the atrium. Two specimens of Covenant technology recovered during Operation: GUARDIAN LANCE were on display in the main atrium. Outside the main complex lies a military airfield, and numerous M71 "Scythe" AA guns. A few smaller outposts, including Farragut Station and Airview Base, were located near the facility. The base also has several maintenance hallways for the facility's engineers. In addition, a Forerunner ship that had crashed in the area millennia earlier had become enveloped by the ice shelf deep below the facility. The crashed vessel contained numerous research stations, including one of Dr. Catherine Halsey's labs. In 2552, the base's head of security was Ádám Virág. Its air controller was known by the call sign Sword Control. The Covenant occupy a ravaged SWORD Base. During the Fall of Reach on July 26 2552, Sword Base became the target of an attack by a single Covenant corvette. As the Covenant launched their assault on the base and the surrounding outposts, the base was defended by UNSC Army forces that were in the area. Soon, NOBLE Team was called in to assist the defensive forces, and ultimately managed to fend off the assault force. After the defensive, two Longswords were called in to push the corvette away from the base, and as the vessel began to depart, one of Reach's orbital defense platforms destroyed it from above. Shortly after, the Covenant launched a full invasion of Reach and Sword Base was invaded, resulting in the deaths of most its ONI personnel; the airfield was reduced to magma and Farragut Station was flooded by the melting ice floes nearby. 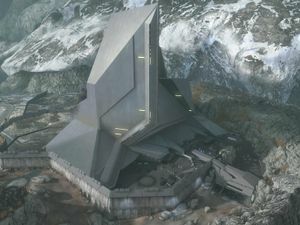 The Covenant forces at the facility soon realized that the base was built on top of a Forerunner site. The Covenant reinforced the ruined facility with numerous ground forces and two anti-air cannons. NOBLE Team was dispatched to destroy the site and prevent any of the facility's secrets from falling into the Covenant's hands in accordance with Operation: WHITE GLOVE. NOBLE Team was soon contacted by Dr. Halsey, who asked them to take a fragment of the AI Cortana to the UNSC Pillar of Autumn. While Carter-A259 insisted that the base be destroyed, Halsey countered that others would perform the demolition. 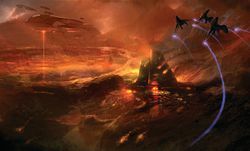 During the package's recovery, the Covenant discovered the Forerunner ship was reachable through the frozen lake near the Sword Base and began sending numerous Phantoms and Banshees to secure the site. Halsey destroyed the ship and the base with explosive charges to prevent them from falling into Covenant hands. Some time prior to Sword Base's demolition, a small team of Office of Naval Intelligence operatives covertly entered the facility with the mission to ensure the destruction of sensitive information as part of Operation: WHITE GLOVE. Discovering Dr. Halsey was still alive, they planned to kill her and destroy her remains to avoid having to evacuate her. ONI also acquired Dr. Halsey's personal journal from her laboratory. A multiplayer map Sword Base takes place inside the facility. The Firefight map Courtyard takes place in the main courtyard outside the entrance to Sword Base. The inner courtyard of Sword Base resembled the inside courtyard of the Pentagon, the headquarters of the United States Department of Defense. The cavern where Halsey's lab was located was designated Sublevel 9. A sublevel of the same name was a central location in the New Mombasa Data Center in Halo 3: ODST. The atrium of Sword Base resembles the main atrium of Third Echelon HQ from Splinter Cell: Conviction. Similarly, both are owned and operated by secret agencies, and both suffer self-detonation. According to concept artist Isaac Hannaford, the designers of Sword Base were given considerable creative leeway due to time constraints. As a result, the design of the base drew on inspirations from a stealth fighter for the outside and a hospital for the inside to give it a very "cold and impersonal" feel. Concept art of the base's defenses and general architecture. A concept art image of the garage of SWORD Base. Early concept art of a hallway inside the base. The main atrium of the base. A schematic of the base's level one. An overhead view of the main atrium. A room in the base. A view outside the base. The outside of Sword Base. The condition of Sword Base, before and after the Covenant invasion. The damaged base from another angle. View of the Sword Base building. The rest of the complex following the Covenant attack. SPARTAN-B312 returns to SWORD Base, reduced to flaming ruins by the Covenant glassing. A plaque commemorating Operation: GUARDIAN LANCE in the atrium of SWORD Base. A Covenant Gravity lift recovered in the operation. A Covenant artifact recovered in the operation.